The fridge is in. We’ll have to unplug it when we lay the new flooring, but it’s here, it works and it offers a beckoning light. 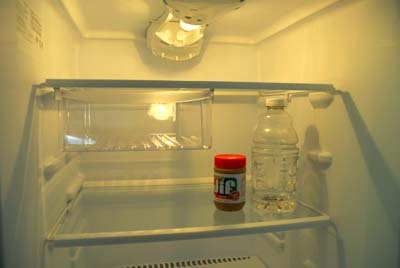 A jar of peanut butter for Cody (we’ve been dog-sitting), a bottle of filtered water and perfectly clean shelves. This will have to suffice for the moment. But it’s our fridge, in our house! 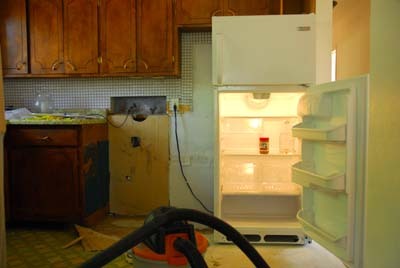 We bought the most efficient, reliable, yet inexpensive machine we could find, a basic Frigidaire with virtually no frills (except glass shelves, easier to clean). It’s small, just 16.5 cu. ft., in an age when consumers can spend $2,000 or more for stainless-steel beasts with water filters, ice makers, computer screens, humidity controls, dairy bins, door alarms, wine racks, meat trays, digital thermometers and 26 cu. ft. of space. After several years in Thailand, with our mini-fridge on a pedestal in a cabinet, I’m flabbergasted by the options here. What would I do with all those bells and whistles? I can’t imagine. In Asia, many of my friends have no refrigerator. They’re lucky if they have an ice cooler. They shop in the market every day. In Chiang Mai, I’d fill our little guy to the max and that would last us approximately three days. When the fridge went empty, I’d walk a few blocks up the street to the Royal Project store and the wet market a block beyond. We had a friendly relationship with The Vegetable Lady. I am thankful for a small fruit-and-veggie market within walking distance, and a branch of El Mezquite Market (oh, I am SUPER excited about this!) just a few miles down the roadâ€”an easy bicycle ride along the Rio Grande. Do you think we might be able to swap El Mezquite for the UK invasion of Walmart? I’m guessing your fridge will soon be stuffed with all kinds of good things. It reminds me of our Silver Lake box. I loved it! And it’s amazing how much more you can get into a unit without cubbyholes, divisions, etc. that someone else thinks you need and which only take up available space.